A few days ago, in the midst of a predictably busy Atlanta rush hour, I decided to drag a friend into Nectar, a fruit juice bar and smoothie shop over in Decatur. Though their original location is in Oakhurst, this satellite spot is over on Clairmont Rd. sandwiched between Bohjanic, Nectar’s parent restaurant, and the much buzzed about Community Q. Though Nectar offers a handful of Panini and a number of breakfast selections, the main focus of this small eatery is their juices, teas, and smoothies. Since we had already consumed an ample lunch over at Café Agora, this was simply a pit stop to tryout a refreshing beverage. As with many places of this ilk, there are a handful of pre-designed beverages and the option to mix and match your own. Smoothies run $3.99 (16 oz.) and $5.29 (24 oz) for the custom constructions or simply $5.99 for their 16 oz pre-designed options (designated as Mega smoothies). In addition, you can always add additional boosters (“superfoods”) for a nominal charge. 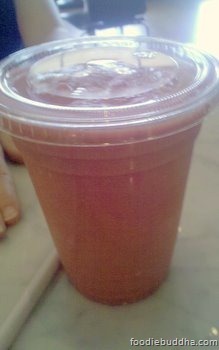 I made a beeline for a 16 oz Pomegranate based smoothie of my design. Though my wimpy camera phone shot doesn’t look great, the drink actually had a rich color. It was prepared quickly and with a very friendly smile, something that I’ve become accustom to while dinning next door at Bhojanic. To be honest, their really isn’t much you can do to screw up a smoothie, but that aside … I was quite happy with my beverage. Everything inside was clean and given the handful of exotic items on the menu (Amazonian Acai, Acerola and Cacao), Nectar certainly did enough to earn my money. Further exploration is needed, but for now … if you’re in the area, it’s a great place to grab a smoothie. It’s also worth a mention that their Oakhurst location does have a sampling of Indian cuisine.